Originating from the proximal cavernous segment of the ICA, the MHT may come off as a single trunk or a collection of vessels. MHT vessels supply the posterior pituitary and portions of the clivus, CN III, IV, V, and VI, pituitary gland, tentorium cerebelli, and adjacent dura. Extensive collateral pathways exist with the ILT, MMA, and hypoglossal branch of the ascending pharyngeal artery. 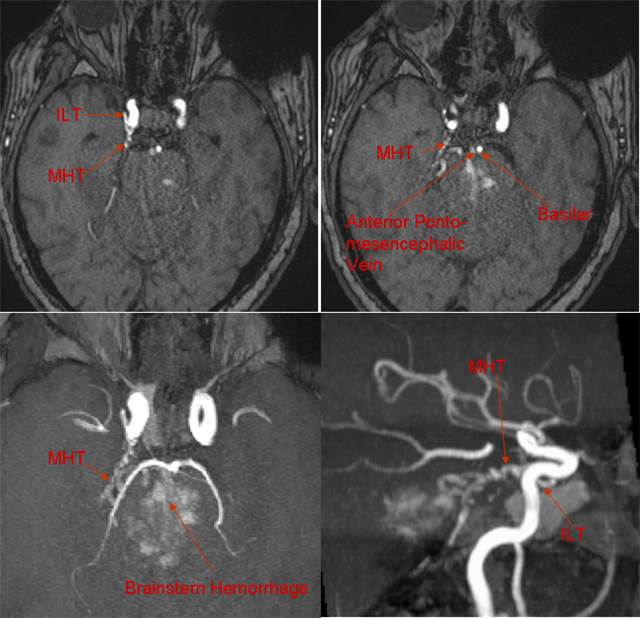 The checkered vessel connecting MHT with the Basilar Artery (P) is the Trigeminal Artery, which may come off the MHT or ILT. A discernible MHT on MRI/MRA or CT angiogram usually means some kind of pathology. The normal MHT is much to small to be resolved on a 1.5T system, although on 3T a prominent but still normal MHT may be seen on occasion. If you happen to see one, look carefully for other problems. You will not miss a huge meningioma within which said MHT will be embedded. What’s much harder to see on MRI/MRA is a dural fistula, so make sure to look for one carefully. If you are a radiologist reading the study and dural fistula is a potential concern of the referring doc, seeing the MHT should be strong enough indirect evidence to proceed to a catheter angiogram. 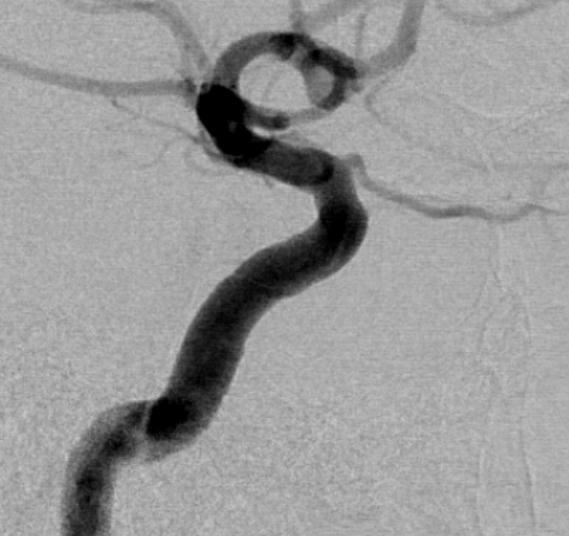 CT angiography may be more sensitive as spacial resolution is better than MR techniques but the same advice applies — it is usually abnormal. Contrast T1 MRI (left) and TOF MRA (right) of a patient with large petroclival meningioma invading the cavernous sinus with a pathologically hypertrophied MHT branch sullying the tumor. TOF-MRA demonstrating hypertrophied MHT and ILT branches supplying a large petrous apex fistula. Smaller fistulas, particularly dural ones, may be very hard to see apart and, apart form visualizing an unusually large feeding vessel, the study looks normal. The best policy in such cases is to tailor the index of suspicion to match study indication. Lateral angiogram early arterial phase demonstrating typical appearance of the MHT — nothing is visible. The size of normal MHT is highly variable — depending on AP, ILT, MMA, and other dural vessels with which it is in balance — a prominent MHT means relatively small contribution to its dural territory from the others. Later arterial phase imaging of the same case demonstrates a pituitary blush — inferior hypophyseal artery would be the source. No distinct MHT component vessels are visualized. Variability is the rule, and parts of the MHT may be visible in various non-pathologic circumstances. 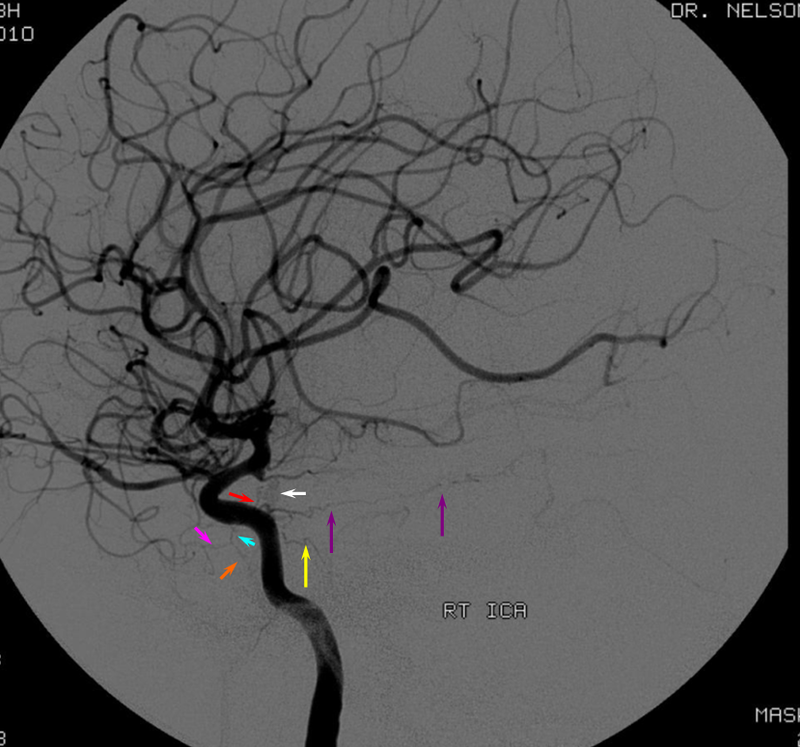 MHT Fakeout: Inferior temporal MCA branches often project in the region of the MHT on the lateral projection (red). On careful evaluation one can see that these vessels actually originate more rostrally (green arrow) from the MCA. Inferior Hypophyseal Artery of the MHT opacifying the pituitary gland with a characteristic blush (no adenoma here!). The branch to the pituitary is well seen on the AP projection usually best visualized in mid-arterial phase and persisting into venous phase. The posteroinferior branch of the MHT classically supplies the neurohypophyisis and portions of the adenohypophysis, although in this case the supply appears to be more extensive. Also notice absence of the ophthalmic artery (see meninigo-ophthalmic variant on the MMA page). Pituitary Gland visualization on rotational angiogram. The rotational is acquired via a long (approximately 6 second) injection while the x-ray camera sweeps an arc around its target. The data is then reconstructed into a 3-D image. Because of long injecting timing, the pituitary plexus is visualized likely in venous phase. 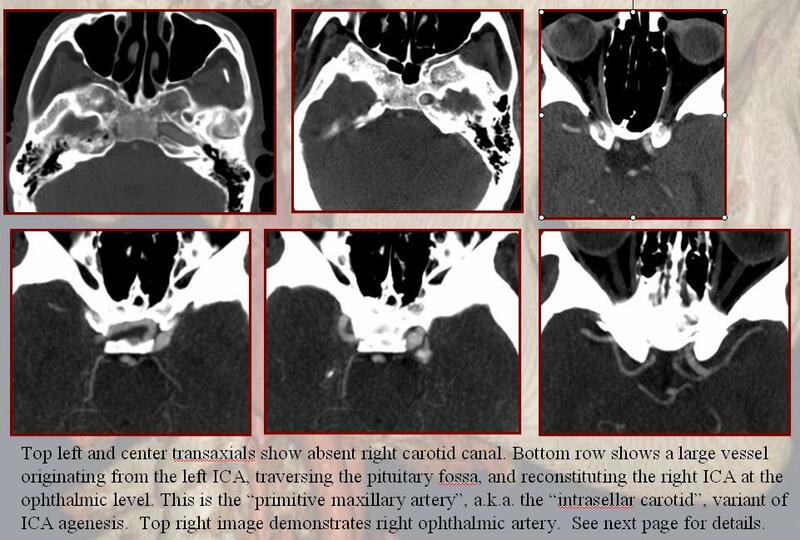 The images below (patient with a pseudoaneurysm of the sphenoid sinus ICA portion in setting of chronic sinusitis) demonstrate little pituitary blush on conventional angio and the inferior hypophyseal branches are not particularly prominent. However the rotational angio, because of long injection timing, shows a vascular plexus within the gland. Primitive Maxillary Artery: The inferior hypophyseal arteries in the embryo are called primitive maxillary arteries. The left and right inferior hypophyseal counterparts anastomose with each other normally and supply the pituitary gland as above. In cases of carotid agenesis involving the petrous segment, the carotid artery can be reconstituted via the contralateral carotid thru thisprimitive maxillary anastomosis. 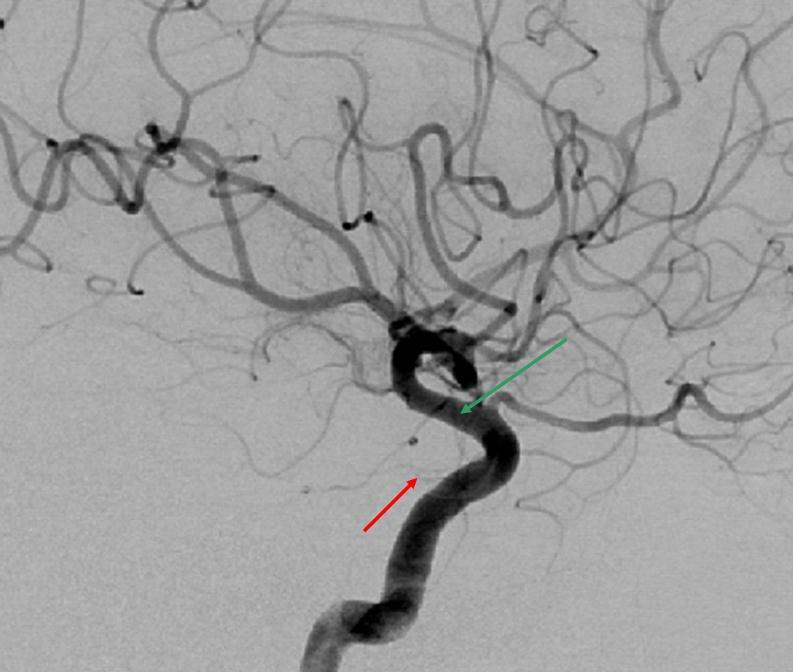 This results in a bizzare large vessel traversing the pituitary fossa connecting one carotid artery to the other, as can be seen below. As in above case of primitive maxillary artery, left to right MHT anastomoses may re-emege in setting of carotid occlusion. 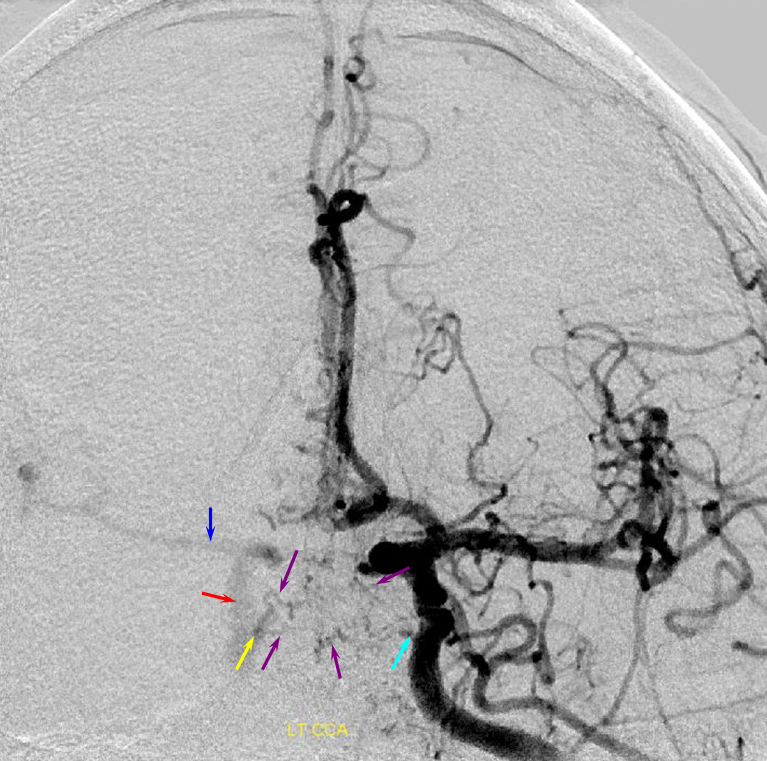 In this patient with insufficient ACOM, the right carotid is occluded. 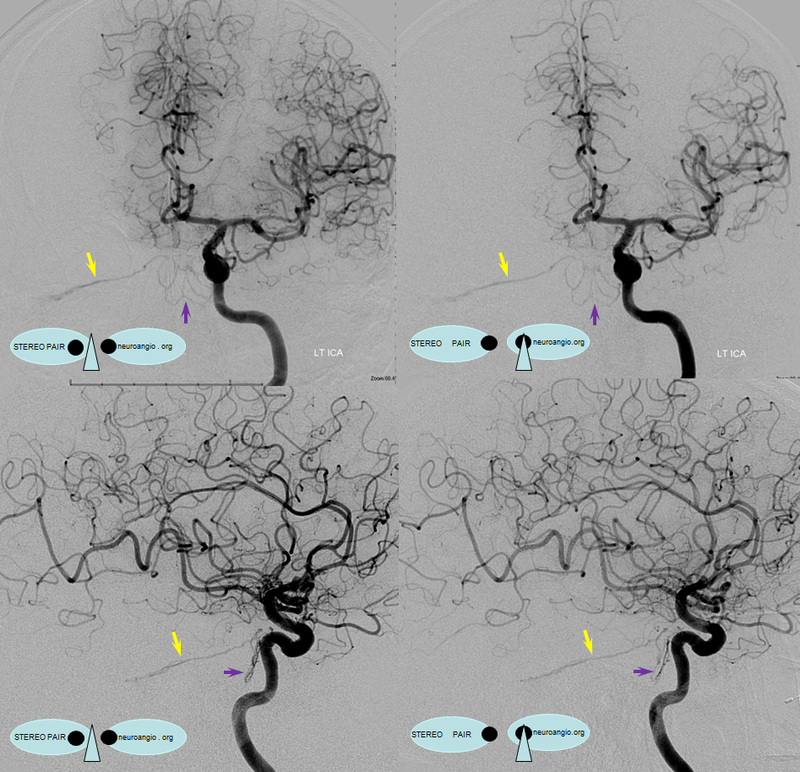 Reconstitution is afforded via accessory meningeal supply to the ILT (see ILT) and via left to right hypophyeseal branches of the MHT, shown below. 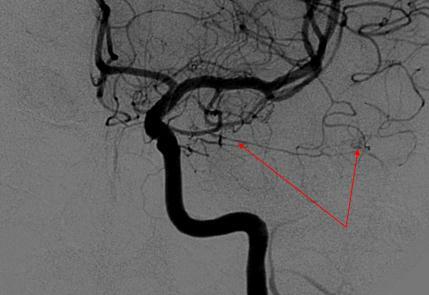 Dural fistula, the anatomists best friend: Perhaps the best way to study various dural branches is by looking at fistula cases, where all kinds of very small arteries can be demonstratively enlarged. Marginal Tentorial Artery — a.k.a. Bernasconi-Cassinari — one of the few remaining named branches, it was described by those men in their study of tentorial notch meningiomas. This artery runs along the medial edge of each tentorial leaf (a.k.a. Tentorial Incisura) towards to torcula. 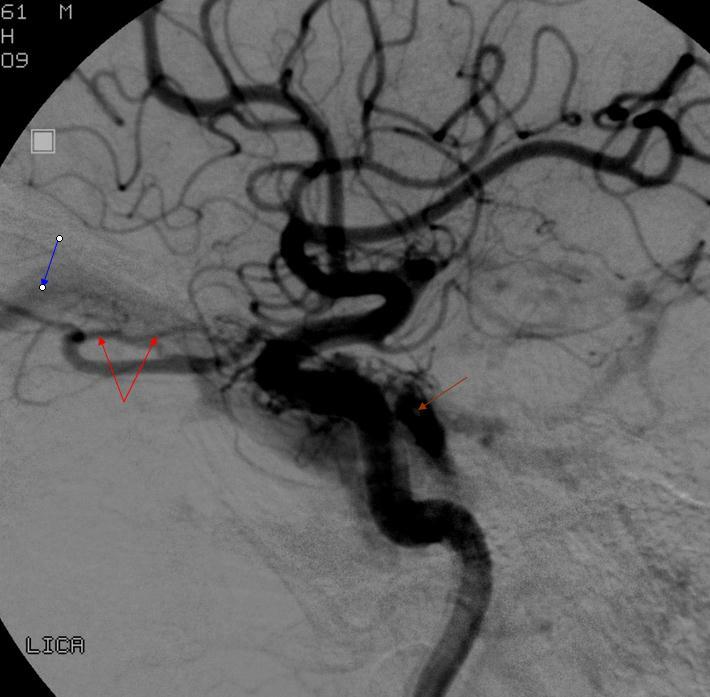 It is difficult to tell this artery apart from the lateral tentorial arcade — which is the artery that runs from the MHT along the lateral aspect of the tentorial leaf towards the sigmoid sinus. On the AP the distinction is easy. The marginal tentorial artery participates in supply of adjacent cranial nerves and dura. Lateral projection of a vein of Galen dural fistula in an elderly man (blue arrow points to enlarged vein of Galen). 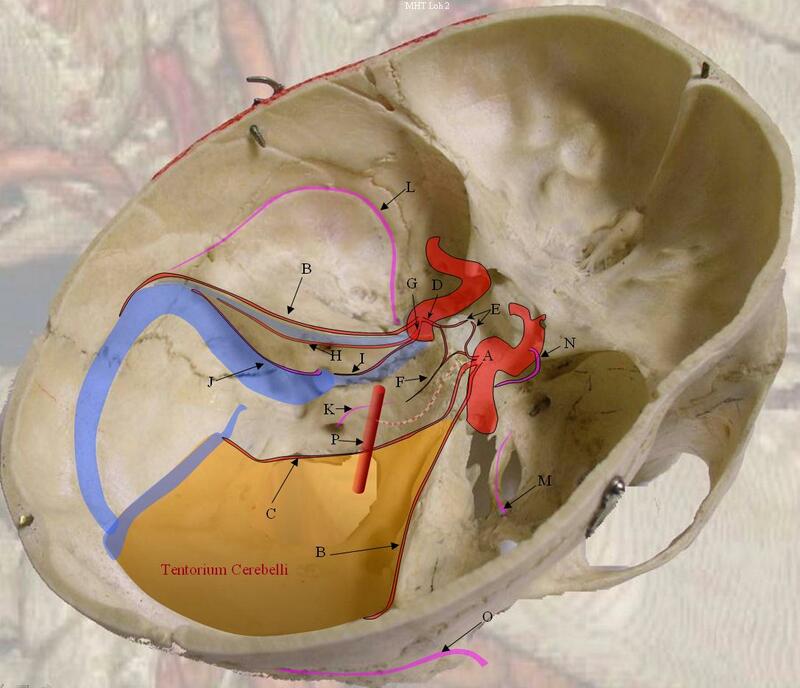 Multiple small vessels run along the medial edge of the tentorium from the MHT (red arrows) to particupate in the fistula. Typically one sees a single maginal tentorial branch but in case of high flow fistulas like this one innumerable tiny feeders develop to the point where the dura is carpeted with vessels (see cases in Ascending Pharyngeal Section as well). PCA and ACA feeders are also prominent. 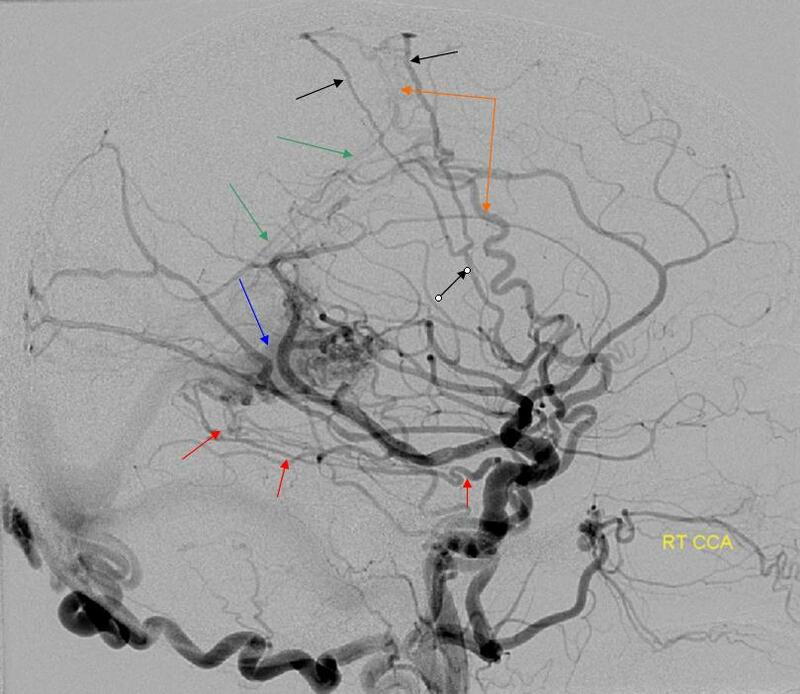 Also notice transosseous branches of the middle meningeal (black) and superficial temporal artery (orange) going towards high convexity and dumping into arterioles of the falx cerebri (green) leading towards the fistula. Lateral (top) and AP (bottom) images of a patient s/p left pterional craniotomy for attempted clipping of an ophthalmic artery aneurysm. The surgery was aborted. The MMA has been sacrificed during the craniotomy. 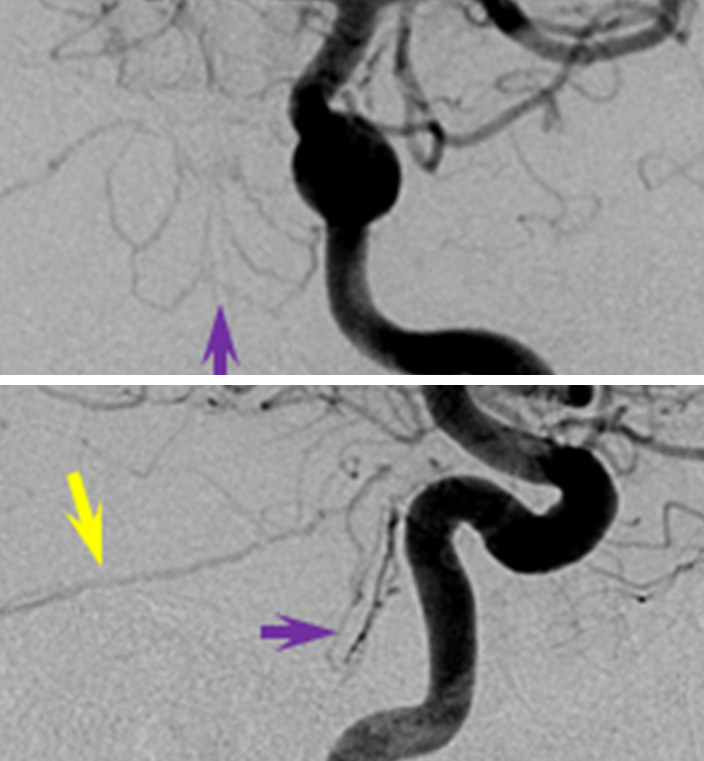 The marginal tentorial artery is secondarily enlarged and now assumes supply of the falx cerebri (purple arrows). Notice the upward course of the marginal tentorial, following the incisura. The lateral tentorial has a more straight or downward-pointing course on the lateral following the course of the petrous apex, which can be well seen on the native images. 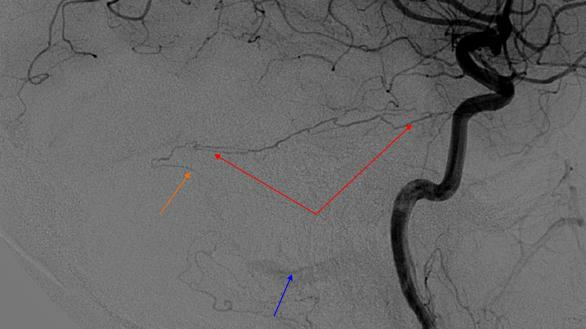 Also notice, incidentally, an unusually large anterior branch of the MHT (red) which is participating in supply of the orbit in this patient. The ophthalmic artery is marked in blue. The same case, 3-D stereo view. 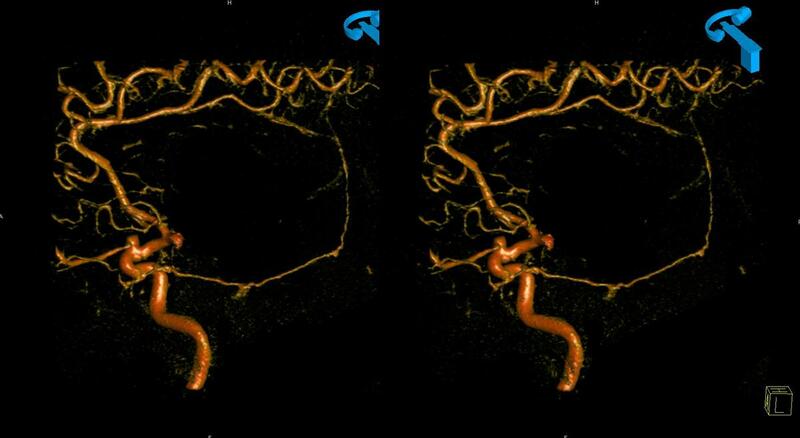 Stereo View of the marginal tentorial artery, which first courses somewhat laterally (see MRA above) and subsequently turns medial towards the falconentorial junction and ascends along the posterior free edge of the falx. The patient is status-post pterional craniotomy and secondary MMA sacrifice. 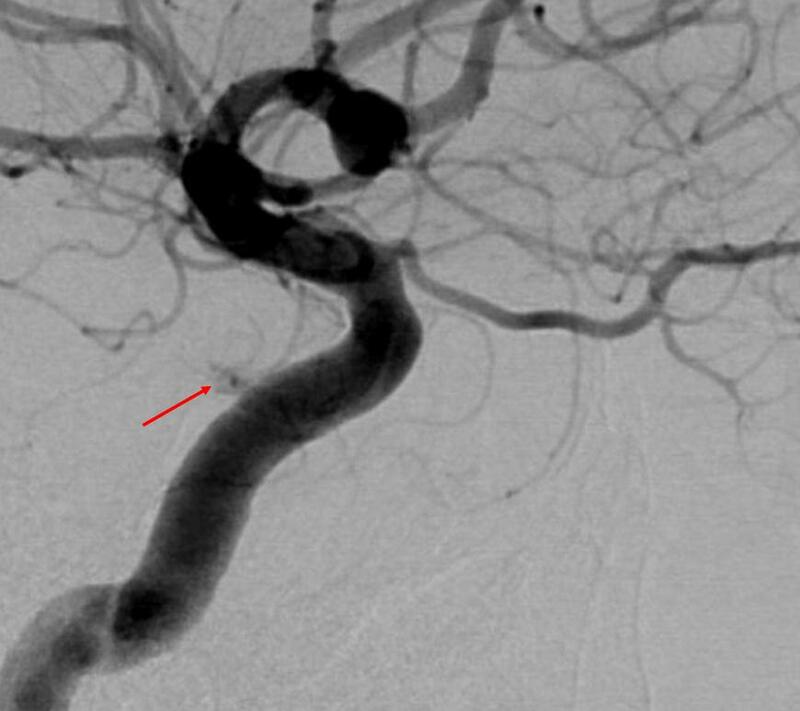 Lateral Tentorial Artery: As above, this artery is a branch of the MHT that runs along the lateral edge of the tentorium cerebelli and along the sigmoid sinus. 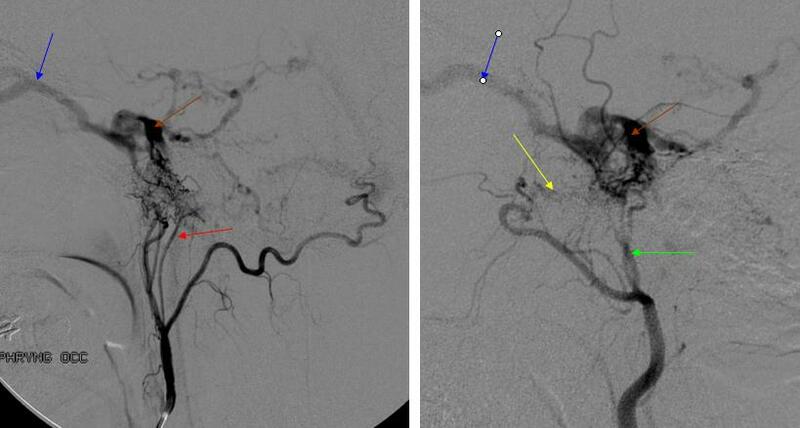 Given that sigmoid sinus is a relatively common location of dural fistulas, this artery is in perfect position to supply it nearly every time. This vessel is easy to differentiate from the Marginal Tentorial by its straight course off midline towards the sigmoid sinus on frontal projections. The same case — lateral tentorial arcade in AP projection. 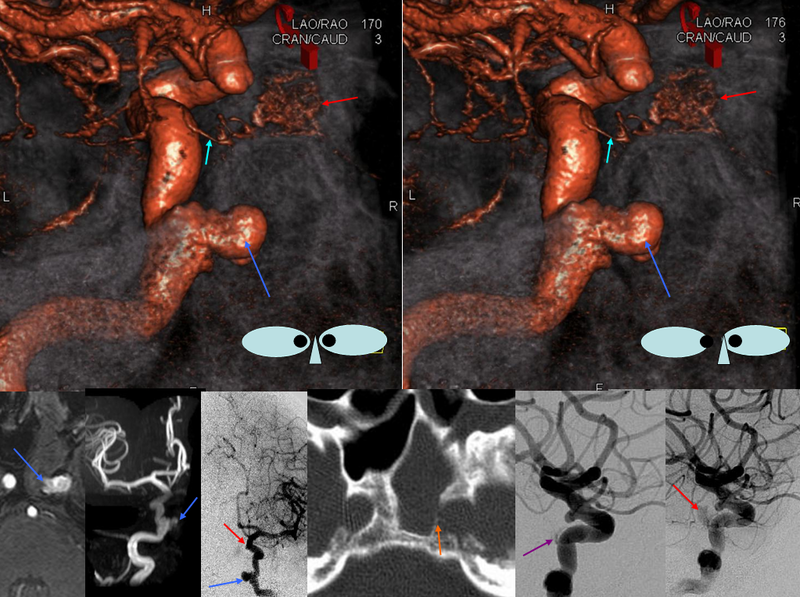 Same case, demonstrating hypoglossal division of the ascending pharyngeal artery (red, and letter H on the top illustration) contribution to the fistula on the left, and MMA (green, letter G on top illustration) and foramen rotundum branch (yellow) contributors on the right image. See also Ascending Pharyngeal section. A dural fistula initially thought to be a glomus jugulare tumor on MRA. The fistula is supplied by enlarged lateral tentorial artery of the MHT and via branches of the occipital and ascending pharyngeal (musculospinal and sigmoid sinus branches) arteries. Notice the characteristic lateral course of the lateral tentorial artery along the petrous ridge. 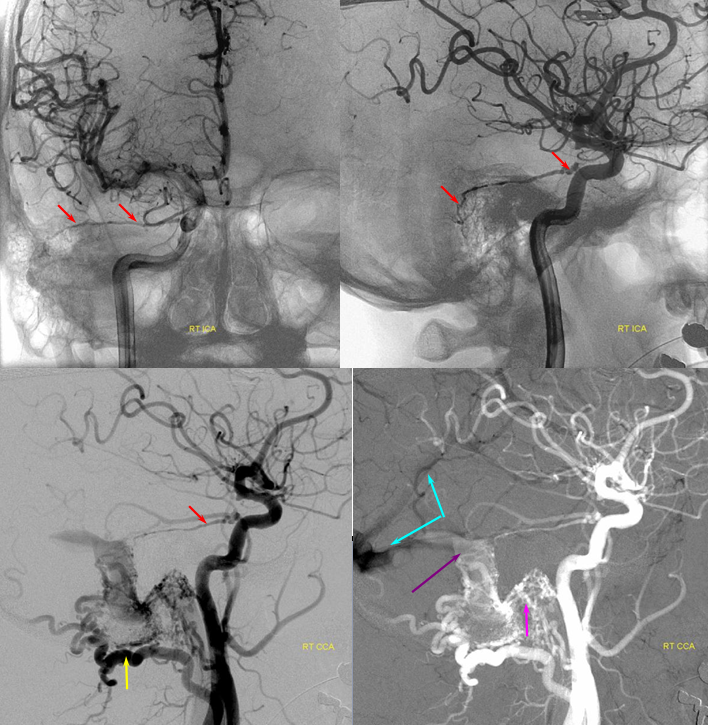 MHT Lateral Tentorial = red; Occipital=yellow; ascending pharyngeal (jugular division of the neuromeningeal trunk) = pink; arterialized flow in the sigmoid sinus=purple. 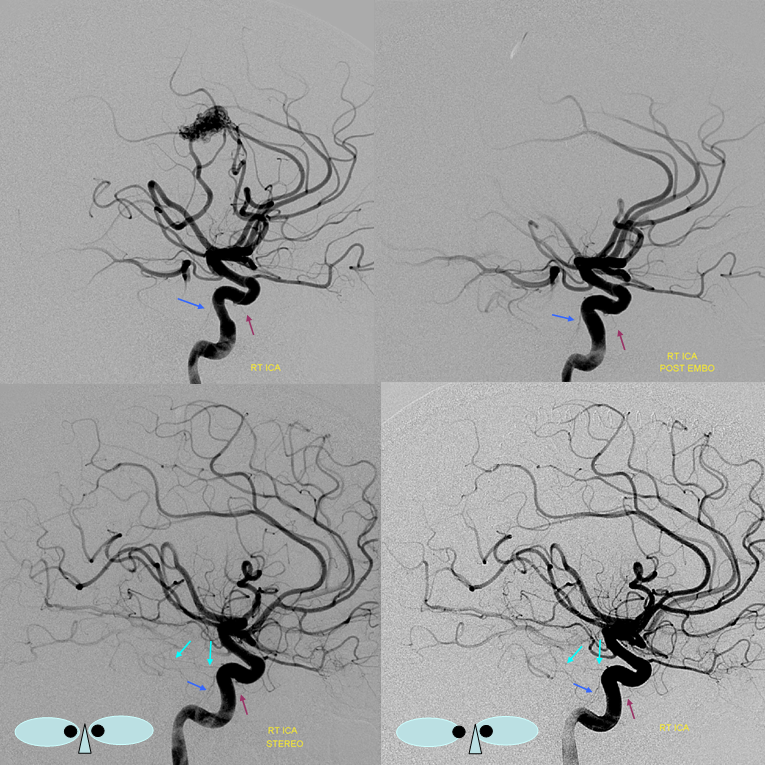 The bottom right image is generated by using arterial phase mask in the brain venous phase (light blue=straight sinus and proximal sigmoid sinus) to highlight arteriovenous shunting.